This beautiful southern skipper is unusually wide-ranging, moving strongly north every year from its Florida base. It is one of several migratory skippers, like the Ocola Skipper, Sachem and Fiery Skipper, which typically arrive in small numbers in our state toward the end of the summer season. It does not over-winter here. Long-tailed Skipper was first figured in the 1780's by artist-naturalist John Abbot, working in Georgia, whose drawings and notes were published as The Natural History of the Rarer Lepidopterous Insects of Georgia, by James E. Smith and John Abbott, in 1797. Abbot found it ovipositing on wild pea vine, and later on cultivated beans (Calhoun, 2006; L. Harris 1972:106). It apparently adapted quickly to bean cultivation in the southern United States, becoming something of an agricultural pest. Its caterpillar is known as the Bean Leaf Roller (Farquhar 1934; Wagner 2005). In the late 19th century, Samuel Scudder and naturalist Charles Maynard found this skipper to be “extremely rare in New England” (Maynard 1886); Scudder refers only to a few specimens taken around New Haven (1889: 1391). There are no historic (or contemporary) Massachusetts specimens in the Harvard MCZ. There are also no historical Connecticut specimens, but the 1995-1999 Connecticut Butterfly Atlas found three individuals during the project period. Massachusetts records likewise begin in the 1990's. Southern New England records since Scudder's day appear to be few or non-existent. Massachusetts records begin in the 1990's. As host plants, Long-tailed Skipper uses several species of peas and beans, as well as introduced soybeans and wisteria. It is another example of a native butterfly species adopting and thriving on introduced host plants (Table 3). Cech (2005) suggests that increased cultivation of soybeans in southern states in the early 1990s accounts for this skipper’s resurgence in its dispersal range since then. Further south it is found in a very wide range of mostly disturbed habitats, where a host plant is present. But in Massachusetts it is usually seen nectaring in gardens, or wherever nectar sources can be found. The 1986-90 Atlas found Long-tailed Skipper to be a rare vagrant. MBC sightings 2000-2007 also ranked Long-tailed Skipper as “Rare” (Table 5). However, Chart 71 presents all known reports 1992-2013, and after two large influx years in 2008 and 2012, this species would now rank as considerably less rare. In 1990 two Long-tailed Skippers were discovered, one in South Hadley by T. Fowler on 2 September, the other in Marshfield by D. Clapp sometime in September. These were the northernmost reports from a significant fall flight of the species in 1990 (Fowler, Atlas account), and are the first known Massachusetts records. Another significant east coast flight in 1994 produced single Long-tailed Skippers at Foxboro and South Hadley. (1994 was also a significant sighting year in New Jersey.) In 1996 singles were seen at Rockport and South Dartmouth; 1997 at Topsfield; 1998 at Ipswich and Chatham; 1999 at Agawam; 2002 in Dartmouth and Saugus; 2003 at Northampton and Orange; 2004 in Marblehead (2); and 2005 in Gloucester and Newbury. In 2008 an especially large number (at least 9 different individuals) were seen-- in Falmouth, Westport, Dartmouth (Allen’s Pond), Newbury, Nahant, and Harwich -- making that a banner year. In 2010, a worn individual was reported from Fannie Stebbins Wildlife Sanctuary in Longmeadow. 2012 saw the largest number of sightings ever reported, 21 individual butterflies, in 15 different towns. Most were from locations which had not reported Long-tailed Skipper before. Several were not in the usual coastal or Connecticut River valley locations. The furthest north inland report that year was from Hubbardston 8/30/2012, W. Howes (photo in Massachusetts Butterflies 39, Fall 2012). Other inland reports were from Maynard (9/14/2012, L. Nachtrab, photo) and Westwood (8/24/2012, E. Nielsen) (see Map 71 below). The remaining reports were from either "the valley" (Northampton) or coastal locations: Scituate (ph), Winthrop (ph), Truro (ph), Gloucester (ph), Plymouth (ph), Newbury, Eastham (ph), Pembroke (ph); Dartmouth (ph), Orleans and Wellfleet. 2012 also produced new early and late sighting dates (see below). 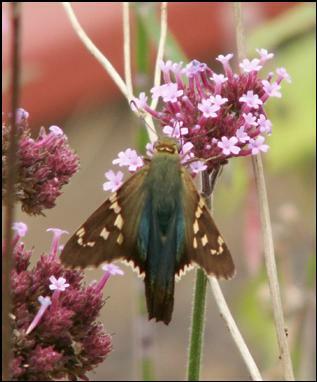 Long-tailed Skipper was seen in 13 (about half) of the 24 years between 1990 and 2013. (The two 1990 sightings are not shown on Chart 71.) Thus in these years this species occurred quite regularly, approximately every other year. An important list-length study of MBC data 1992-2010 found a 33.7 % increase in detectibility of this species over this time period, although the result did not reach statistical significance given the low numbers (Breed et al. 2012). A similar sightings increase has occurred in the cases of Ocola Skipper, which has been seen in 10 of the the 19 years 1991-2009, Fiery Skipper, seen in 17 of these 19 years, and Sachem, seen in 11 of the 19 years. For all four of these skippers, there are essentially no Atlas or historical records, and the sightings increases have come just within the last 20 years. 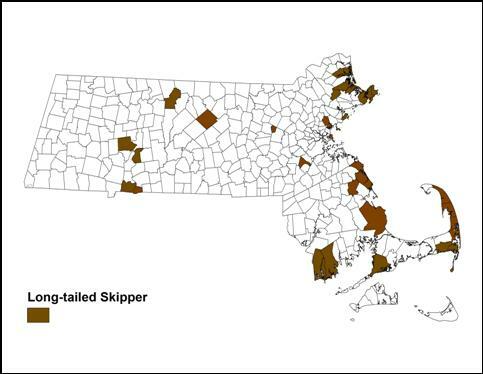 Long-tailed Skippers have arrived mainly along the southeast and northeast coasts, including Cape Cod but not (so far as we know) the Islands, and secondarily in the Connecticut River valley. From 1990 through 2013, the skipper has been seen in 31 out of a possible 351 towns. The furthest north sighting location is along the coast, at Newbury (several reports, including 9/13/2012, D. Saffarewich). The next furthest north is Orange (9/22/2003, S. Heinricher), in Franklin County. There are reports from several towns north of Boston, including Topsfield, Rockport, Ipswich, Marblehead, Nahant, and Saugus. All of the Essex County, Boston area, central Massachusetts (Orange and Hubbardston) and Connecticut River valley reports shown in Map 71, when taken together, extend the range of this skipper beyond that shown in Opler and Krizek (1984) or Cech and Tudor (2005). Opler and Krizek's map from the 1980's does not show Massachusetts at all, while Cech and Tudor's map shows only the southeastern region. The increasing movement north of this skipper has been striking. In 2012, this skipper was found for the first time in three locations in Maine (MBS 2013). There is a single 9/1994 record from Vermont (McFarland et al. 2010). All sightings have been in August, September, or October. Long-tailed Skipper 1990-2013 has arrived only at the end of the season, with little time left to reproduce. Over-wintering has been precluded by its lack of cold tolerance. Earliest sightings: In the 24 years between 1990 and 2013, the earliest three BOM-MBC "first sightings" are Aug. 6, 2012, Scituate, mjj302 (BAMONA photoreport); Aug. 7, 2010, Longmeadow Fannie Stebbins WS, M. Arey; and Aug. 10, 1999, Agawam garden, L. Fieldstadt. The largest influx year, 2012, also had 9 other August reports, most accompanied by photographs; the next earliest in that year being 8/14 Winthrop, R. Mosco (ph); 8/17 Truro, T. Hansen (ph); 8/19 Northampton F. Model (ph); 8/22 Gloucester, R. Heil http://www.flickr.com/photos/rsheil/7842225744/in/photostream/ and others later in August. Latest sightings: In the same 24 years, the three latest "last sightings" have been 10/25/2012, Wellfleet, M. Faherty; 10/12/2008, Westport Gooseberry Neck, M. Lynch and S. Carroll; and 9/30/1996, Dartmouth south, B. Cassie. Only in the two large influx years were individuals seen into October; all other last sightings were in September. Sightings of Long-tailed Skipper have clearly increased in Massachusetts in the last twenty years, and since Scudder’s time. This state will probably see more of this southern visitor if climate warming continues to move its dispersal range northward, and if southern populations remain stable (Table 6). Already the Massachusetts sightings are north of previously published range maps. Earlier arrivals here could be expected, and if so then a successful brood might become possible.